YouGov | When is a feminist not a feminist? på mars 8, 2018, 8:34 a.m. The theme for International Women’s Day 2018 is #PressforProgress which encourages people to continue fighting for equality and acknowledges the international movement of tackling gender differences and sexism. 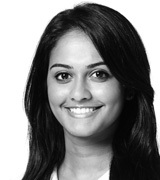 Feminism – that is to the advocacy of women's rights on the ground of the equality of the sexes – has, arguably, been the key driving force behind positive progress for women in society. But how many people understand what a feminist is? New YouGov Eurotrack research suggests that, across Europe, the term may be poorly understood. Respondents in seven European countries were randomly asked one of three questions to ascertain whether they identified as a feminist. The first group were shown a question directly asking whether or not they are a feminist (this is the Word-Only group). The second was asked whether men and women should have equal rights and status in society (the Definition-Only group). The third were told that the definition of feminism was believing that men and women should have equal rights and status in society and then asked whether or not they are a feminist (what we call the Definition+Word group). In all countries, the vast majority of people in the Definition-Only group (80-91%) say that they believe men and women should have equal rights and social status. By contrast, the Word-Only group sees far fewer respondents saying that they are a feminist – between 8-40%. The results of Definition+Word come in between the first two groups: having seen feminism defined, 42-70% of respondents say that they themselves are feminists. Germans are by far the least likely to say they are a feminist in answer to either of the questions where the word “feminist” was used – 8% of those in the Word-Only group and 42% of the Definition+Word group. However, the Germans in the Definition-Only group are about as likely as people from other nations to say they thought men and women should be equal (80%). At the other end of the scale, across all three groups the Swedish are the most consistently feminist. While in all other nations, those in the Word-Only group state they are not feminist by a wide margin, in Sweden people split 40% saying they are and 41% saying they are not. 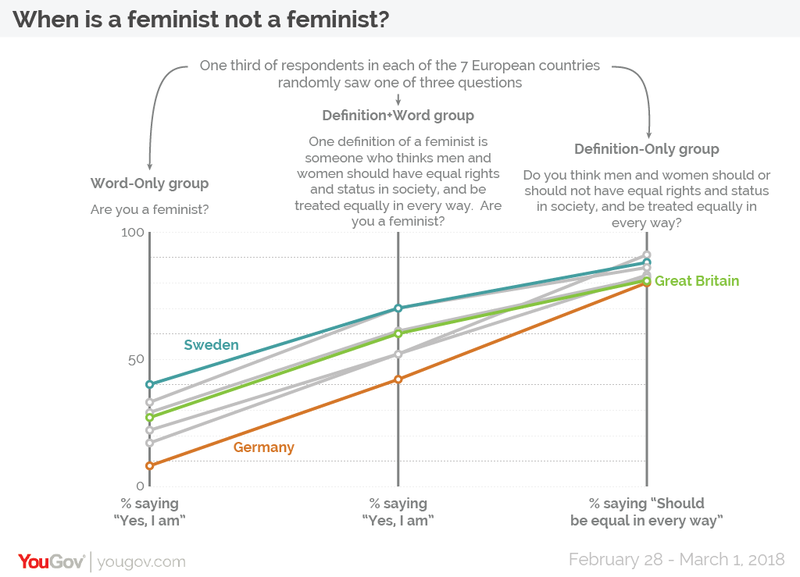 The Swedish Definition+Word group were the joint-most likely of all seven nations to say they were a feminist (70%, alongside the French), and the Swedish Definition-Only group were the second-most likely to say they thought men and women should be equal (88%, behind the Finns on 91%). The fact that people across the continent are markedly more hostile to the term “feminist” in isolation, while at the same time so readily subscribing to the ideals the term represents, suggests the term itself has a serious image problem. It seems that yet another battle that feminists must now fight is the battle to reclaim the word itself.